The BBC strives to operate under a system of three fairly distinct categories of ride, based primarily on how aggressive they are in speed. The length of the rides will vary from time to time along with the style (hill repeat, flats, training, etc.) but the intention is that the relative speeds be reliable. A sample of the routes regularly followed on these rides is located under “Route Maps”. The starting location and start time for the rides is intended to be the same, subject to group preferences, so that on any given day a rider may decide to step up a notch or down, depending on his or her preference and the size of the ride. Nobody should avoid attending a ride out of fear that he or she will be “outclassed” from the start, but be realistic about the group you wish to start with and be prepared with water and other sensible requisites. The BBC utilizes its Groups.io site to announce ride changes and schedules and to broadcast reminders of the ride schedules and other events to the membership. "A" Rides - Aggressive with multiple accelerations, averaging 18-20 mph with long stretches between 20-25 mph. "B" Rides - Medium pace with some accelerations, averaging 16-18 mph. "C" Rides - Modest steady pace, averaging 15-17 mph. This is a "no drop" ride. “A” and “B” rides generally will range from 40 up to 60 miles. “C” rides will normally stay in the 25 to 30 miles range. 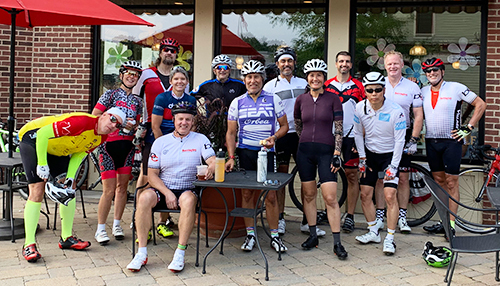 If a large number of riders attend a ride wishing to participate in a particular level, that group will be divided further to avoid creating too large a mass on the roads. Meeting location: Lutheran Church at Hillside/Dundee Ave.
Meeting Location: Lutheran Church at Hillside/Dundee Ave.. Specific information about these rides is sent to club members via our Groups.io postings.